Happy Monday friends!! What a weekend - we soaked up all the beautiful weather and did all the Fall things, basically in one day!! I'm pretty pumped for the week - Sia concert tomorrow night & off to Nashville for an extended long weekend, but before that - here's how we took advantage of the beautiful weather this weekend! Nashoba Valley Winery is our one stop shop for all things fall! Gary and I have been going here for the last 5 years and it's never disappointed. About 30 miles outside of the city you get to take in the amazing views of the valley, get all the Fall foliage you could want, go apple and pumpkin picking AND taste wine! 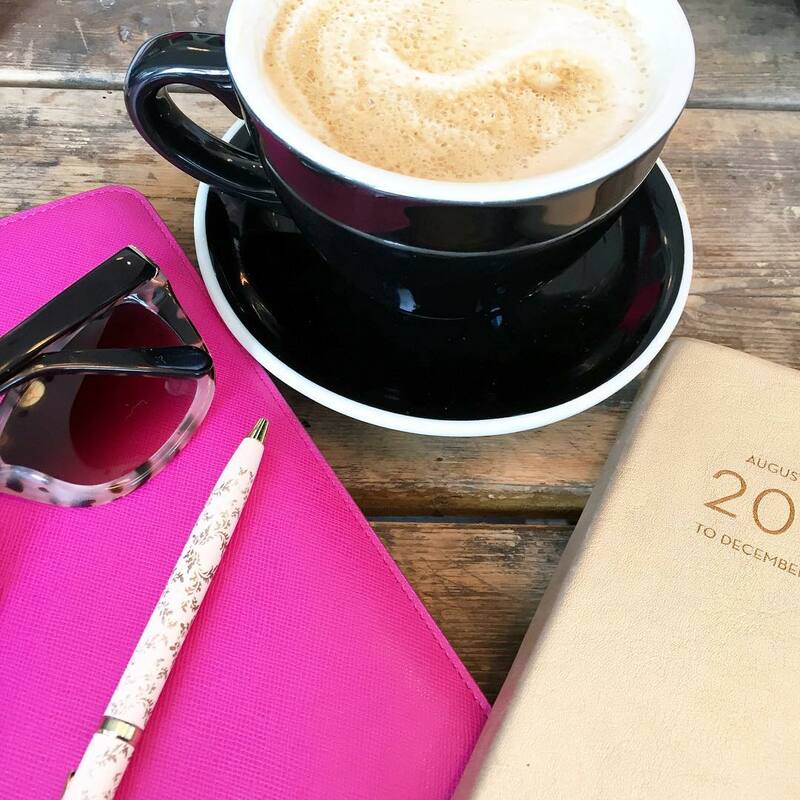 The trick to getting the most out of your time there, is trying to beat the crowd - so get there early! We started with the wine tasting at 11:00 AM which is perfectly acceptable if you ask me! For $8/pp you get a variety of wines to sample & a wine glass - which we have way too many of now! You can also do the tour, but since we've done it before - we just get straight to the good stuff! You could eat lunch at J's restaurant or preorder a packed lunch to enjoy a picnic outside! Last year I discovered that you could preorder and it's a game changer! The views of the vineyard are a perfect backdrop! Before apple picking you have to get an apple cider donut (or two)!! 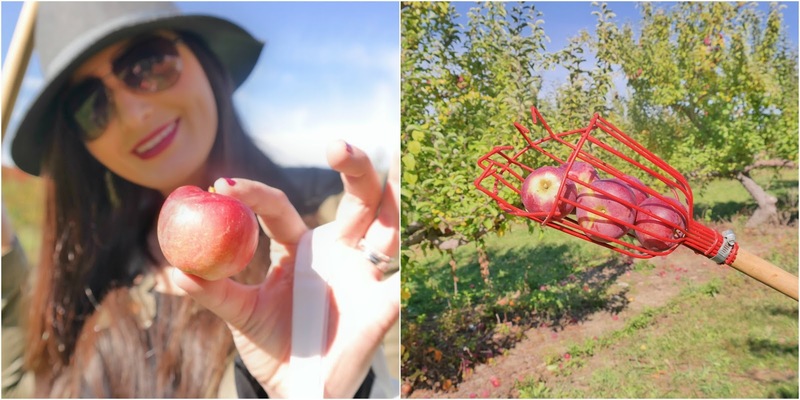 Then it's time to get your apple pick on! This was the first year we used the apple picking poles and I fully admit Gary was way better at it than me! We went throughout the orchard and while most of the trees to the front were picked through - there was a great section in the back, where the poles came in handy, that had the best looking apples!! Now the fun of actually eating them and baking a pie or two! I usually have lofty goals of carving these fabulous pumpkins, but poor Gary ends up doing about 75% of the work and then they don't keep - so we opted for 6 smaller pumpkins of different colors and varieties to keep around the house and use as decorations! Last year they stayed until after Thanksgiving - talk about a great ROI on a $6 investment! Sunday morning I joined Core Power Yoga on the roof deck of Ink Block for a fun outdoor yoga session! I think I've said more than once that I am not a yoga person...something about not being able to still my mind, but maybe acupuncture has changed me because it somehow "clicked" and I felt like I could be a tree and downward dog with the best of them! Just kidding - far from being able to balance on one leg, but at least now I feel like I should be able to handle it! A long-ish stroll through the park, much needed mani/pedi & lots of prepping for the week ahead rounded out Sunday! After being on the go for the last few months, I have to say this was one of my favorite weekend's out of the entire year!! A lot of fun and relaxation! Stay tuned for a little fashion post this week! How was your weekend? Link up below to share it with us! What a fun fall weekend! 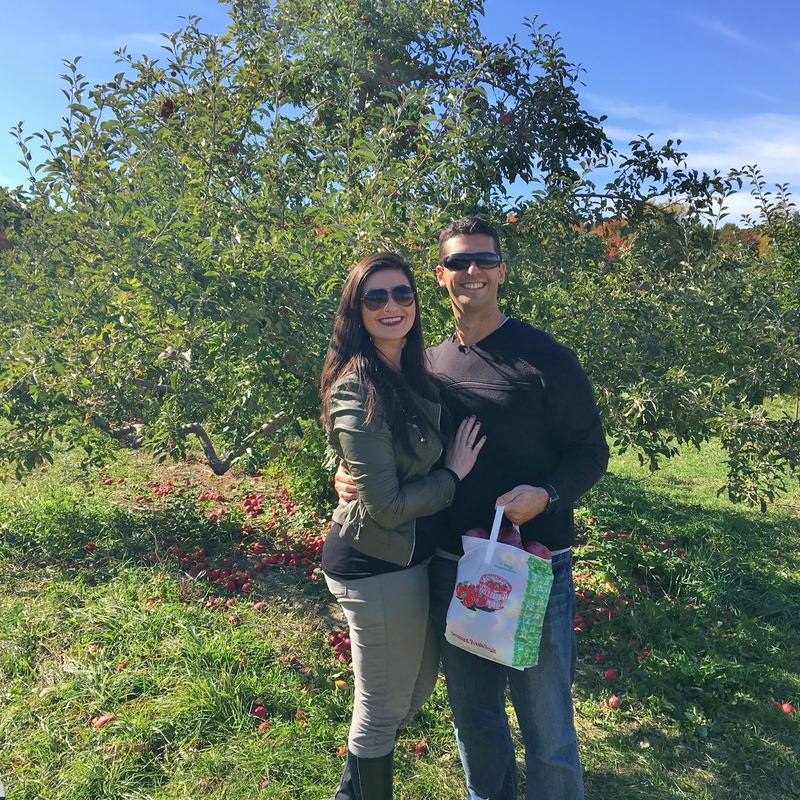 I wish we would have had time to go apple picking the other weekend, I've never been! And yes to all the apple cider donuts! Exciting week ahead for you, enjoy the short week! Love the apple picking! And every time I read your blog I get city-living envy! I think it would be so awesome to live in the middle of it all and be able to walk everywhere. And also have so many things going on around you...like yoga on a rooftop! Definitely not available in small town Alabama haha! 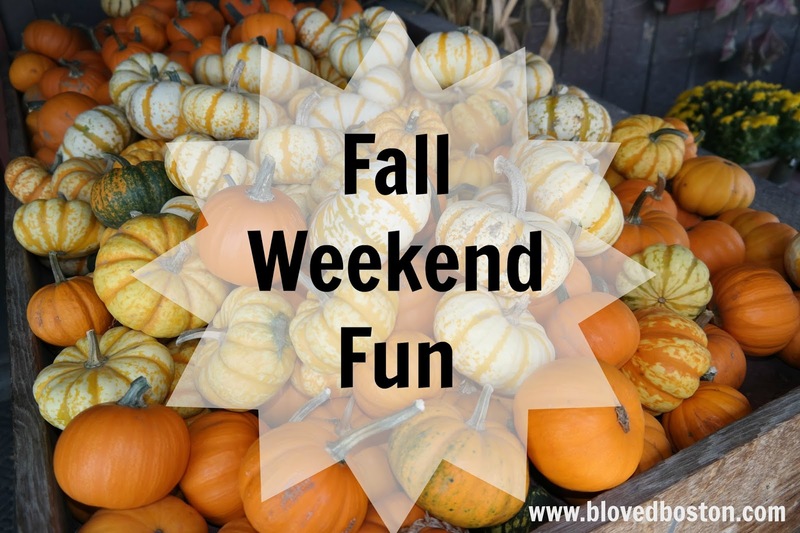 So much Fall fun in one post! Nashoba winery sounds perfect to enjoy the fall weather, sip on some wine and enjoy the views. It looks beautiful there. Yayy to Nashville next weekend! That place sounds like the coolest - wine, apple pick, AND pumpkins all in once place?! Sign me up! 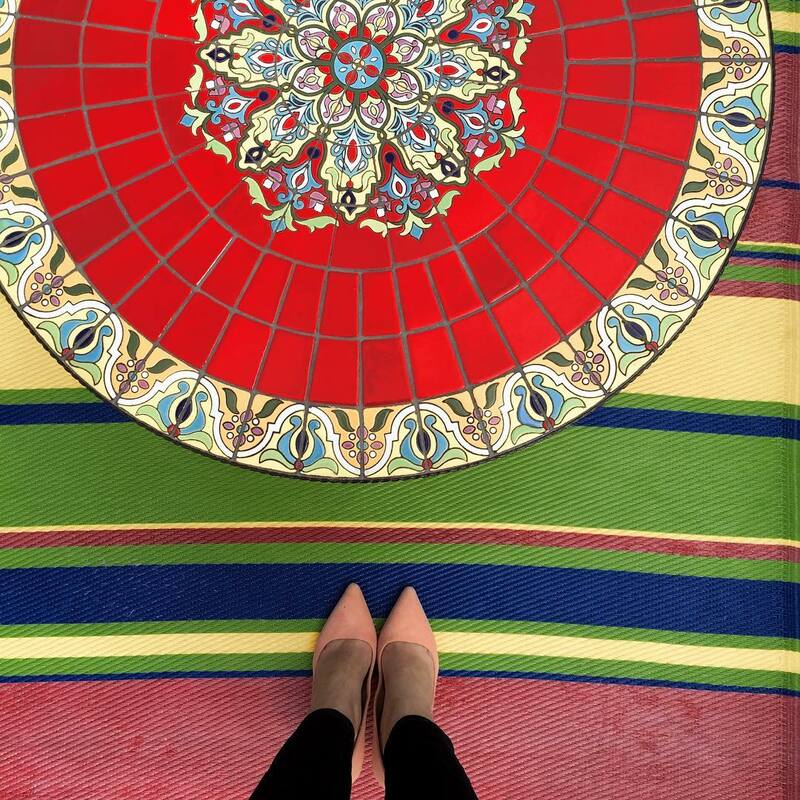 I have never been a yoga person, either, but I feel like I need to give it a try again - especially if it's on a gorgeous rooftop! Happy Monday! what a fun weekend! apple picking sounds so fun and that apple cider donut looks amazing! I haven't had one since I was young and living in michigan! Such a fun fall weekend y'all had! The same thing happens to me with pumpkins; I think I can make cool-looking designs, but I usually just end up making a basic jack-o-lantern. I would rather use small ones as decorations and not cut them. I have never been apple-picking, it's on my list of things to do one fall. That park is lovely. It looks like such a fun and beautiful weekend. We are headed to the pumpkin patch today and we can't wait. Have a great time at Sia, love her! Glad this was one of your favorite weekends! Looks so fun... and that apple cider doughnut looks truly delish!! This really sounds like the perfect weekend! How awesome that you can pick pumpkins AND do a wine tasting! Sounds like the absolute best and most perfect Fall weekend in New England. October is 100% my favorite month to be up north. Such a fun weekend !!! I would love a couple of those apple cider donuts :) Happy Monday ! What a great fall filled weekend!!! So jealous of your apple (and donut ;) ). I hear you on the yoga. I hated it for ages, and then about a year ago, I became hooked! Happy Monday! That picture of you two by the apple trees is so cute! 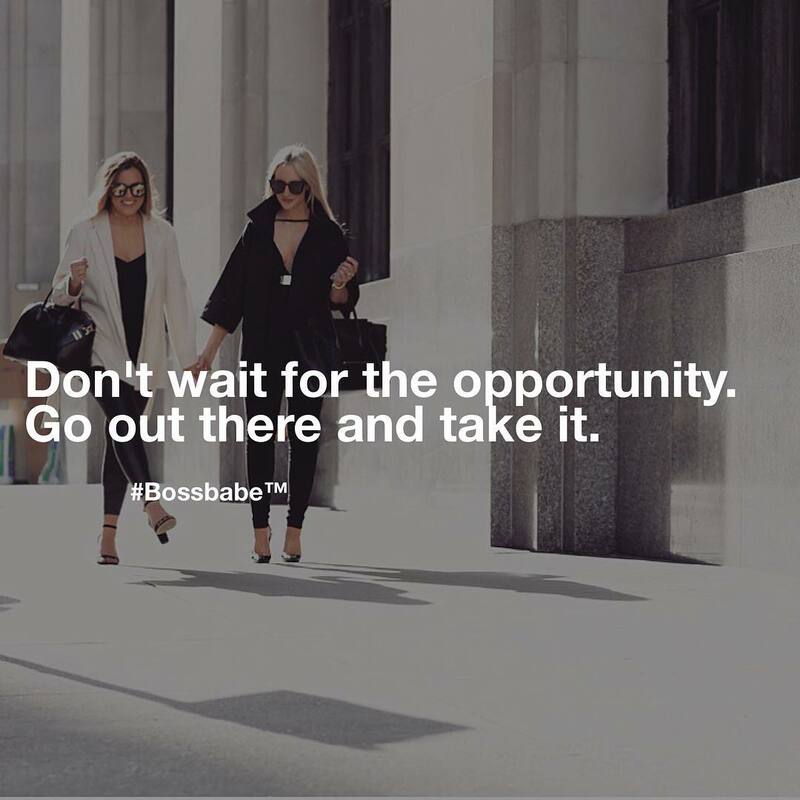 I'm really connecting with your image from Boss Babe! I'm hoping to follow that mantra more this week. So jealous! 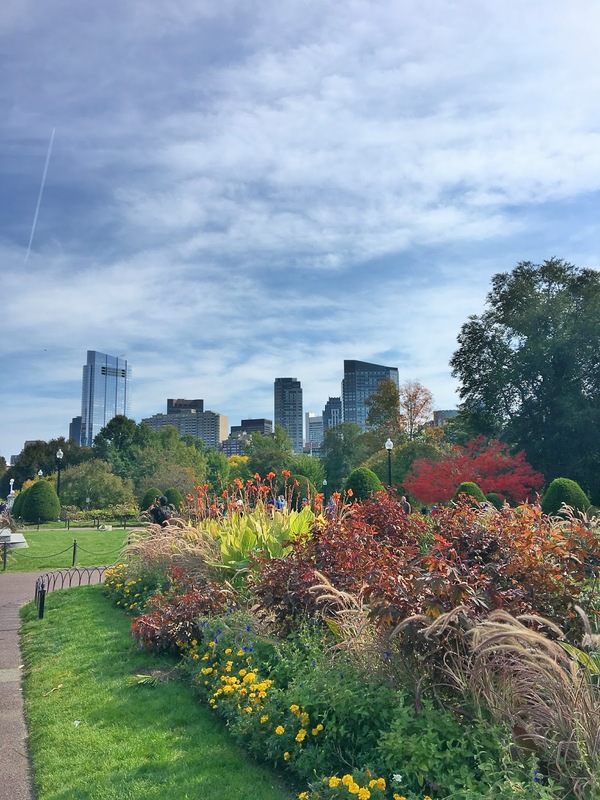 You got to do all the fun fall things this weekend and the weather looked amazing! I feel like I'd be horrible at apple picking using the poles. I am not coordinated enough for that! And yay for yoga clicking this time!! Happy Monday love! Okay that Nashoba Winery sounds AMAZING! You get all of my favorite things in one place! And that apple cider doughnut looks amazing--they're my absolute FAVORITE! seriously what a perfect fall weekend! that winery looks so fun and you can never go wrong with apple picking! i have never used the stick thing before when i have gone but i can imagine it wouldn't be pretty haha. yay for yoga! it's funny bc some days it is easier and some it's just too tough - never know! glad it clicked though! So wine, apples and pumpkins all in once place?!?! That sounds like the perfect place to visit! What a fun tradition you guys have. And I think a wine tasting at 11am is perfectly acceptable. Sounds like you had an amazing fall weekend! Hope you have a great week! This sounds PERFECT! All of that in one location!?! It's like a fall dream come true! You literally had the most perfect weekend! I am trying to get pumpkin and apple picking signed off my fall bucket list! It looks like you had a blast! Looks like a fun fall weekend! That donut looks delish! Looks like it was the perfect fall weekend. The weather on Saturday was perfection for apple picking. I sort of wish I had a cider donut right now. haha Happy Monday!! Looks like the perfect fall weekend, such lovely pictures. Looks like a perfect fall weekend. I've never seen these apple picking poles before. Granted, I haven't gone in forever. I like the idea of just using smaller pumpkins for decorations. Happy Monday! Okay totally jealous of your weekend! I have been wanting to find a cool local winery (after pregnancy I guess, womp womp) and go apple picking! So perfect for fall. I'm so glad you had a wonderful weekend, beautiful! I saw a sneak peek on IG the other day and it looked like you had such a great time at the winery! We had plans on going apple picking this past weekend, too, but then as you know, I got sick and totally ruined the plans :( We're hoping we can go next weekend and bring my mother-in-law who's never done anything like this before (she's from Guatemala) so I'm sure she'll love it! Now, you have me craving apple cider donuts, haha. Thank so much for sharing, beauty, and I hope you have the most amazing week ahead! Nashoba looks like a ton of fun. i have never been apple picking, those poles look legit and i could 100% guarantee i'd be horrible with them and KC would be better too haha. i'm glad yoga is clicking for you, must be the acupuncture. a wine tasting is totally acceptable at 11am, i mean it's not like you're drinking entire bottles ;) those doughnuts looked so good, i went out and got doughnuts from the grocery after i saw your picture and i totally blame you. haha! but they were just plain and chocolate iced, definitely not sustenance like your apple cider ones haha. Yalls weekend looks absolutely fabulous! So fun! And that apple picker thingy? So nifty! Seriously THE perfect fall weekend - I was enjoying all your snaps! Now I really want to go apple picking and get more apple cider donuts. Yum! Sounds like the perfect fall weekend! I've been dying to go apple picking! what a charming adventure! looks like so much fun! Oh my goodness, your weekend sounded absolutely perfect and like the best fall weekend in New England! I love that you got to pick apples and pumpkins, and you're totally right about it being perfectly acceptable to wine taste that early in the morning! I hope that your Monday is off to a great start! I would think that apple picker thing would take some practice, for sure. Your weekend sounds absolutely perfect and that winery really is a one stop shop! Loved all of your pics! So glad you two had a relaxed weekend, especially after the 2 back to back weekends of wedding fun. We are hoping to visit a pumpkin patch this weekend, hoping it doesn't keep raining...if so, it will ruin our plans. The donut sounds so darn good!! Hope you are having a great Monday! Looks like such a great weekend!! I love your jacket! So pretty! I MUST try an apple cider donut at some point! Gah, they look so good! We were wanting to go apple picking in the mountains this week, but all of the orchards said that they are no longer having the You-Pick because they've all been picked. I'm SO sad! The most perfect Fall weekend! Have fun is that orchard and with wine and everything! This was such a great fall weekend! I love how you can do so many different fall things all at the same place! This looks like such a fun weekend! I carved pumpkins this weekend and mine actually turned out for once haha! Looks like y'all had a great day filled with fun and love. I would love to go apple picking some day. Great lovely photos! Wellll I'm craving donuts now! Looks like y'all had such a perfect weekend! That wine looks delicious! Looks like you had a great weekend :-) Quick question what program do you use to edit your first pic with the Fall weekend fun? Thanks! I'm embarrassed to say that I have never been apple picking :( it's on my bucket list though! I love Nashoba Valley Winery! They have some amazing wines! I have never used or seen the apple picking poles. Those are pretty cool. What a great investment in the pumpkins. Looks like a great weekend. I know Ashley and Emily from the last picture. Very sweet women! Sounds like a fabulous weekend! I am all about not carving pumpkins because they last so much longer for zero work! That seriously sounds like a perfect fall weekend. I've never seen those apple picking poles but they look awesome! And apple cider doughnuts are awesome! When we were at the orchard a few weeks ago I was trying to explain to my husband how weird it is that orchards here don't have donuts! We always had them growing up and they're soo good, definitely something I miss here! We started getting mini pumpkins too-- I was going to make them glittery or something, but didn't feel like even the mess of that! haha. Wine, pumpkins, apples, yoga...sounds like the perfect weekend. So I have a question...how did you find a good acupuncturist (is that a word?!) and how did you know what it'd help you with?